Fort Lauderdale, FL – Gas prices took another tumble at the pump this week, according to the U.S. Energy Information Administration. The weekly E.I.A. fuel price survey shows the average price of one gallon of regular unleaded fell to about $2.81, nationwide, which is down three cents from the previous week’s survey. Prices finally fell in all regions this week, unlike the previous two weeks’ declines. Even so, on the West Coast, the last region to get a price break amid the recent spate of declines, prices only dipped about two cents per gallon. Elsewhere, prices fell at a more substantial rate, particularly in the Lower Atlantic and Gulf Coast regions, where prices shed between five and six cents per gallon, on average, according to this week’s E.I.A. survey. Truckers caught a good break, for a second week in a row, according to the E.I.A. Diesel prices fell well over two cents per gallon, nationwide, to settle at about $3.36. This week’s average fuel prices for all regions are shown below, as gathered from www.eia.gov. Fort Lauderdale, FL – For a second consecutive week, retail gas prices dropped for most U.S. drivers, according to the latest weekly fuel price survey from the U.S. Energy Information Administration, a branch of the Department of Energy. The E.I.A.’s weekly survey shows the cost of an average gallon of gas plunged nearly four cents this week. That brings the average U.S. price for a gallon of regular unleaded down to about $2.84. Prices continued rising along the West Coast and in California, pushing each regional average up by about a penny. Elsewhere, prices were down for most drivers, often substantially, from the Rocky Mountain states to the Lower Atlantic. In the Midwest, home to frequent and dramatic price swings, the average gas cost fell a stiff seven cents per gallon, on average. Truckers finally caught a break, themselves, this week, according to the E.I.A. survey. Diesel fuel prices fell about one and a half cents, on average, this week, the first time diesel prices have fallen for several weeks. The average cost of a gallon of diesel is about $3.38, according to the E.I.A. This week’s average fuel prices for all regions are shown below, as gathered from www.eia.gov. Fort Lauderdale, FL – Gas prices finally did an about-face this week, declining after six weeks of increases, according to the U.S. Energy Information Administration. Overall, the nation enjoyed a price dip of more than two cents per gallon, the E.I.A. reported this week, although one key region was still impacted by a significant price increase. Nonetheless, the nation’s average price for a gallon of regular unleaded fell to just under $2.88. Prices spiked once more on the West Coast, sans California, as prices pushed nearly a nickel per gallon higher, the E.I.A. price survey showed this week. Elsewhere, prices ticked up slightly in the Rocky Mountain States, while the average driver in the Midwest watched prices fall by well over six cents per gallon, a leading factor this week in the decline of the U.S. average fuel price, according to the E.I.A. report. For truckers, the news was not so good, but it was not nearly as bad as last week, according to the E.I.A. numbers. Overall, prices nudged up about a penny per gallon to settle just over $3.39 per gallon, on average. This week’s average fuel prices for all regions are shown below, as gathered from www.eia.gov. *Columbus Day on October 8. Report released October 9, 2018. Fort Lauderdale, FL – The cost of gas continued moving higher during the past week, according to the latest weekly fuel price survey from the U.S. Energy Information Administration. 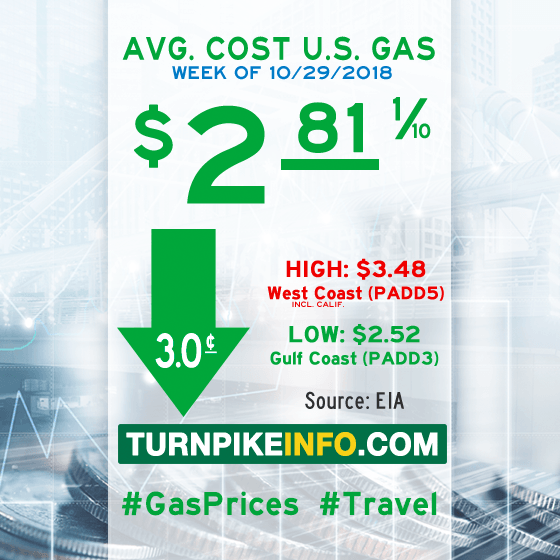 The E.I.A.’s regional price report shows the average cost of a gallon of regular unleaded is now over $2.90, after moving upward nearly four cents during the past week. 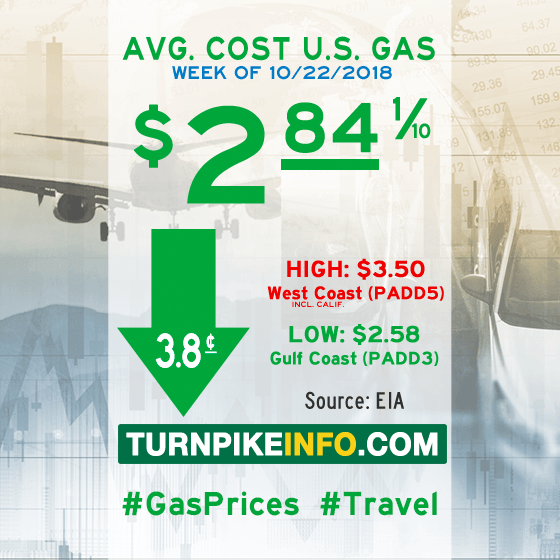 Prices continued to spike on the West Coast, settling over $3.47 per gallon for the average driver in that region, as prices jumped over six cents for the second consecutive week. 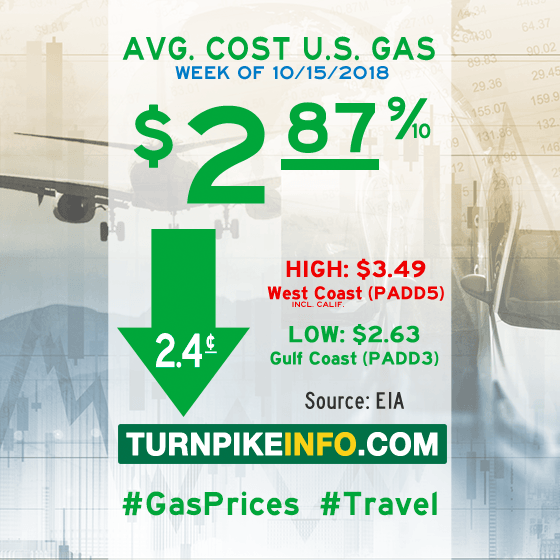 Drivers in the Lower Atlantic states, facing the potential landfall of Hurricane Michael this week, watched as prices pushed up to nearly $2.75 per gallon. Only drivers in the Rocky Mountain states avoided a price surge, as prices remained flat across that region, according to the E.I.A. The news was practically grim for truckers, who watched as prices jumped by over seven cents per gallon this week, according to the E.I.A., marking nearly 12 cents in increases in the past two weeks, alone. The national average diesel price is now nearly $3.39 per gallon, according to the weekly price report. This week’s average fuel prices for all regions are shown below, as gathered from www.eia.gov. Fort Lauderdale, FL – Gas prices stopped trickling higher during the past week, according to the U.S. Energy Information Administration, instead flowing freely upward more than two cents per gallon, with stronger surges in key regions. On average, U.S. drivers are paying about $2.87 this week for a gallon of regular unleaded, according to the E.I.A.’s weekly price survey. Prices spiked on the West Coast, particularly in California, as prices drove more than six cents higher, regionally, and nearly ten cents higher in the Golden State, according to the E.I.A. In the Lower Atlantic region, drivers watched prices lurch over four cents per gallon during the past week, by the E.I.A. survey. Prices along the Gulf Coast moved upward by more than three cents per gallon. Nationwide, the news was worse for truckers, by a factor of two. Diesel prices increased by more than four cents per gallon, on average, according to the E.I.A. The national average cost for diesel is now over $3.31 per gallon. This week’s average fuel prices for all regions are shown below, as gathered from www.eia.gov.